Marie Skovgaard’s The Reformist follows Sherin Khankan, a feminist revolutionary this American had never heard of, but who is practically a household name in her hometown of Copenhagen. Khankan, Denmark’s first female imam, founded the Mariam Mosque, one of the first in Europe to be led by women. And fortunately, Skovgaard was there to artistically document the mosque’s difficult birth as well as the trials and tribulations (both internally and externally) the uncompromising religious leader faced in its aftermath. Filmmaker spoke with the Danish director prior to the doc’s opening night, CPH:DOX premiere on March 21st. Filmmaker: So how did you and your team first meet Sherin and her team? Was everyone onboard for filming the doc from the start? Skovgaard: I met Sherin and Hicham for the first time in the spring of 2015. Sherin had just publicly announced that she wanted to start a mosque with female imams in Denmark. I got very curious to know what that meant. I have an interest in women who are on a mission, who want to create impact — to change the status quo. Sherin is such a person, visionary and very determined. In the beginning the group was quite small. Around five to seven people all accepted to be a part of the film and allowed me very generously into their discussions on writing their manifesto and exploring what they should stand for. I very quickly knew that there was a film. 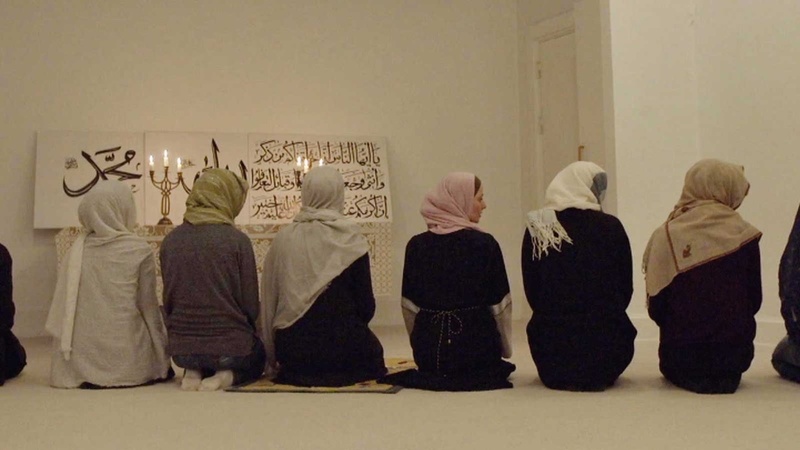 It is a rare account of men and women who want to create change within a religious field, and at the same time I was documenting the historical process behind one of Europe’s first women-led mosques. When the group grew larger not everyone wanted to be a part of the film so I had to find ways to work around that. It’s no secret that the Muslim community is sensitive to media and cameras. Some didn’t want to be part of the film at all for various personal reasons, and some wanted it to some extent. I of course have to respect that as a filmmaker. But I guess it’s also about trust — building that trust with the people in the mosque so that they got to know me. And that they knew I respected their different reasons for why they could or could not be in front of the camera. Filmmaker: We learn very little about Sherin’s backstory. Indeed, it’s not until 40 minutes in that we even learn she’s half-Syrian. Why did you decide to wait so long to reveal such personal details? Skovgaard: I’ve made a film that is primarily observational and is more interested in the active now than in the past. It was my ambition to prioritize showing active observational scenes that show and dimensionalize the demand for change in the community over the biographical interview-based scenes. We prioritize showing scenes with women facing difficult dilemmas, who seek help from the women-led mosque. Women who want to get an Islamic marriage to a non-Muslim, which is a big no-no in traditional Islam. Women who are forced into marriages they do not want to enter. Women who go to Sherin to get an Islamic divorce from their abusive husbands, who could not get that help and support before Sherin and the mosque gave them the opportunity. For me this is the real story of the film. We even meet a homosexual couple who want to have an Islamic wedding. But Sherin cannot get the mosque’s full consent due to a lack of theological support and cannot help them though it pains her. Sherin is the vehicle that gives the audience an insight into all of these powerful “now” stories, which I find important to tell. But I also do not shy away from telling of the sacrifices and struggles that this work is causing Sherin. She is often very alone in her struggle. She is impatient. She does not want to wait. She follows her heart even when it’s not strategic. Waiting 40 minutes to understand Sherin’s backstory was not something my editor Rasmus Nyholm Schmidt and I planned specifically. This film has been very tightly knitted. There is a lot of information that we needed at the beginning of the film to understand why Sherin has this dream — who are the people around her, what do they stand for, what traditions are they breaking with, and so on. It felt natural that we arrived at a family scene after their first Friday prayer, to understand what her parents think about it all and through that scene understand her roots. Filmmaker: Sherin also strikes me as a bit of a micromanager — which made me wonder if she put limits on access to her personal life. Did you feel that she was trying to control the narrative in any way? Skovgaard: Of course there are limits when you make documentary films. It’s real people’s lives. Once bitten twice shy. Sherin has had bad media experiences before, and so she takes care. That makes sense to me. That being said, we are with her in very hard moments. We meet her family, we meet her kids, and she shares her divorce story, which is not easy for an imam. In terms of Sherin’s personal life, I have more material than what made it into the film. We ended up not using it because this film is about what happens in the mosque, and the women who seek help from the imams for Islamic marriage or divorce. I had to stay true to that. It’s not a film about Sherin as a mother or a friend. Furthermore, Sherin wanted from the beginning that the film should not only be about her. She wanted it to be a group portrait. However, the reality was that Sherin continuously was the driving force behind the project. Today it looks a lot different. There are now three imams in the mosque, and a group of young women take turns calling to prayer, delivering the Khutbah, and leading the prayer. If I was to start the film now it would be a different one, of course. This film is about the very first steps in becoming an imam and opening the mosque. Filmmaker: Throughout filming there were several disagreements between Sherin and her board members, which I’m guessing might have made production awkward at times. How did you go about navigating the clashes between your characters? Skovgaard: All filmmakers need diplomatic skills and the ability to see things from more than one perspective when conflicts between characters arise. This production was no different, and of course it was not always easy. Our protagonist is headstrong — which is why she’s able to do what she does — and she equally surrounds herself with other strong characters. Filmmaker: As much as I support Sherin’s noble feminist cause, I’m also troubled by the idea of a half-white European woman being hailed by the Western media as “the new face of Islam.” It just smacks of appropriation. (I likewise found it disturbing that Sherin, a religious leader, seemed to have a lack of self-awareness, or perhaps it was denial, around the issue — or the optics at the very least.) Did you find yourself conflicted about your main character — and if so, how did you deal with that? Skovgaard: The brilliant director Viktor Kossakovsky famously said that a great character isn’t one that we “only” love. There has to be something we also doubt, and a real hero has flaws. Doubts are crucial for making art. I think that is true. That being said, we live in different societies and cultures, and maybe it’s good for both of us to be aware that none of our cultural systems are based on universal truths but on discourses. Europeans are generally more concerned about class. Americans are, in general, more concerned about race, etc. For me one doesn’t have to have a certain color to be a “true” Muslim, and I think the premise of the question is very problematic. Do Christians need to have a certain color in order not to appropriate Christianity? Muslims luckily do not always conform to our Western stereotypes, including the color of their skin. As I see it this is not the time to be divisive between the women who have the guts to challenge status quo. Women have to unite — not divide ourselves. Neither do I agree with your suggestion that Western media are hailing Sherin as “the” face of Islam. But it is true that BBC Magazine in one article posed the question, “Is Sherin the future of Islam?” without answering this question with reference to Sherin’s own book, “Women are the Future of Islam.” I think her importance is no less than other amazing Islamic feminists like Amina Wadud. Sherin was the first one to create a women’s mosque in Europe with female imams, which offered me an active process I could film in order to make an important conversation. This is what I did. Luckily Islamic feminism has many faces, and many of them have different backgrounds, including racial, and you meet some of them in the film as well. I thought it was even important to point to and film the males who actively support Islamic feminists. One of them is the former chief prosecutor Nazir Afsal. Another is the young activist Hicham Mouna, who sadly died from a failed lung transplant in the middle of shooting my film. Hicham had been dedicating his life to feminist activism when a stranger gave him the lungs. I really admire him. What all the characters have in common is the courage to confront an old patriarchal system even though opposition from traditionalists, as well as the Danish Islamophobic right, is quite bad.